The Farm Bill has long been criticized as out of step with consumer desires for healthier foods, stronger connections with local farmers and environmental goals. But the Farm Bill has also not worked well to support a marketplace for farmers and ranchers that provides a stable and fair return. 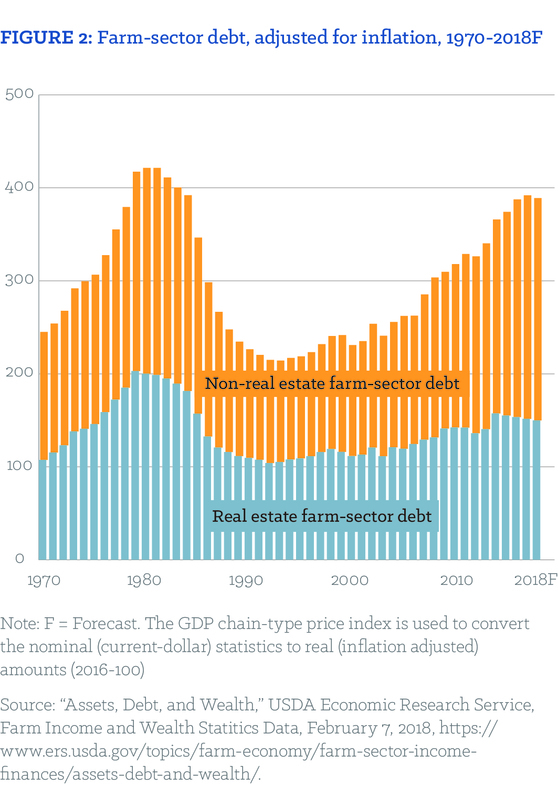 The current farm economy is underwater after multiple years of low prices, low farm income and increasing debt. Many of the problems in the farm economy are linked to a Farm Bill that reinforces a low price, export-dependent system. This dependence on highly-volatile global markets is a policy choice that benefits global agribusiness firms operating in multiple countries, but it has pushed hundreds of thousands of U.S. farmers off the land, and contributes to a lagging rural economy. President Trump’s trade fights with major export markets like China, Mexico and Canada threaten to further drive down prices for farmers and ranchers connected to global markets. 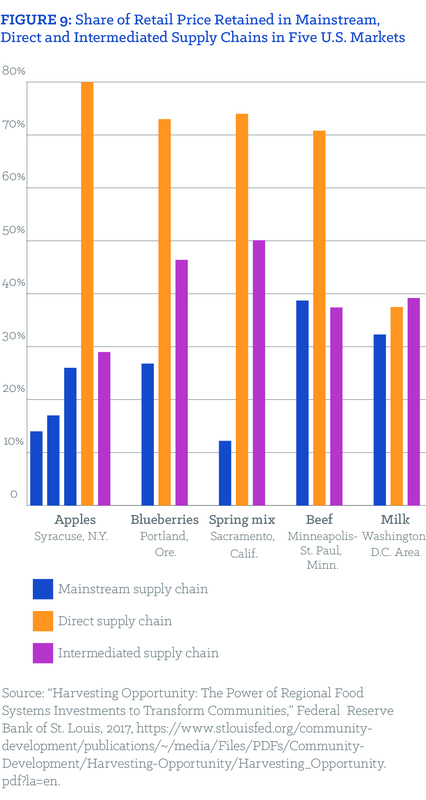 While conventional agriculture markets struggle, the U.S. does have smaller, but fast-growing and higher-value markets emphasizing health, environmental and ethical improvements in farming; but entering these markets poses challenges for many farmers. As Congress debates another Farm Bill, greater resources and improvements should focus on a series of underfunded Farm Bill programs to complement reforms in trade and competition policy that could better support farmers who want to pursue these higher-value domestic markets. U.S. programs should also acknowledge the right of other countries to support their farmers in meeting their own countries’ food demand through more sustainable production methods. For U.S. farmers and rural communities, new thinking on how we can better support farmer profitability and rural development—rather than repeating past mistakes—is urgently needed. Current and past Farm Bills play a role in today’s farm crisis. A variety of Farm Bill programs support expanded production of a handful of commodity crops to feed into a global agricultural market. Commodity and crop insurance programs help manage both financial and weather-related risks for farmers growing commodity crops. These risk management programs, combined with federally-backed credit, encourage bankers to provide loans for these crops. Much of USDA-led research into seeds and production systems also support the expanded production of these same commodity crops, used primarily for animal feed, processed foods, and biofuels. 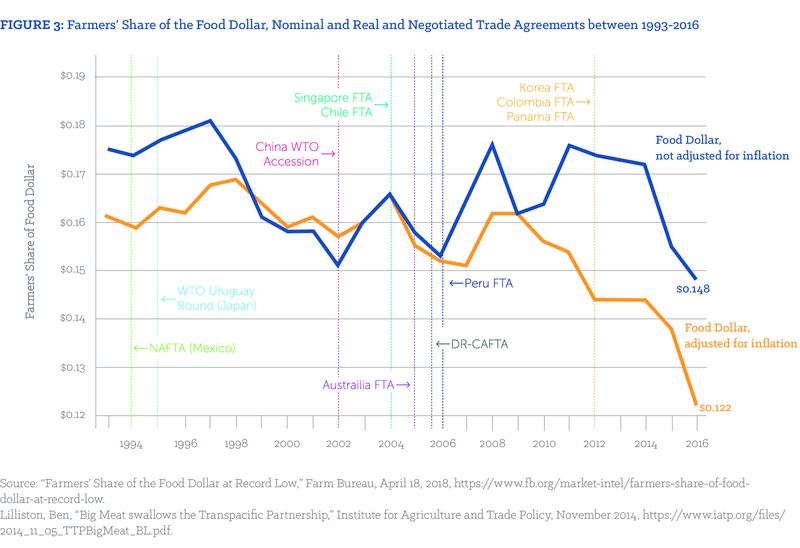 The Farm Bill has combined with a series of free trade deals (like the North American Free Trade Agreement, known as NAFTA) to deepen U.S. agriculture’s reliance on expanding exports to sop up excess production—whether corn or dairy or pork. Several decades of mergers within the agribusiness sector have left a handful of global companies controlling most segments of agriculture. Within this system, U.S. farmers are highly vulnerable to the whims of global agricultural markets and the global firms that play there. U.S. farm policy beginning in the 1930s focused more on stabilizing fair prices for farmers, including price floors and other supply management tools. After decades of aggressive lobbying by agribusiness, the 1996 Farm Bill ended the last of those programs. Prices plunged almost immediately and Congress had to pass a series of emergency payments to keep farmers on the land. Since the 2002 Farm Bill, Congress has built in so-called “safety net” programs with the expectation that in many years farmers will lose money from the marketplace (prices will dip below the cost of production). This system serves agribusiness companies in search of low-priced commodities well. 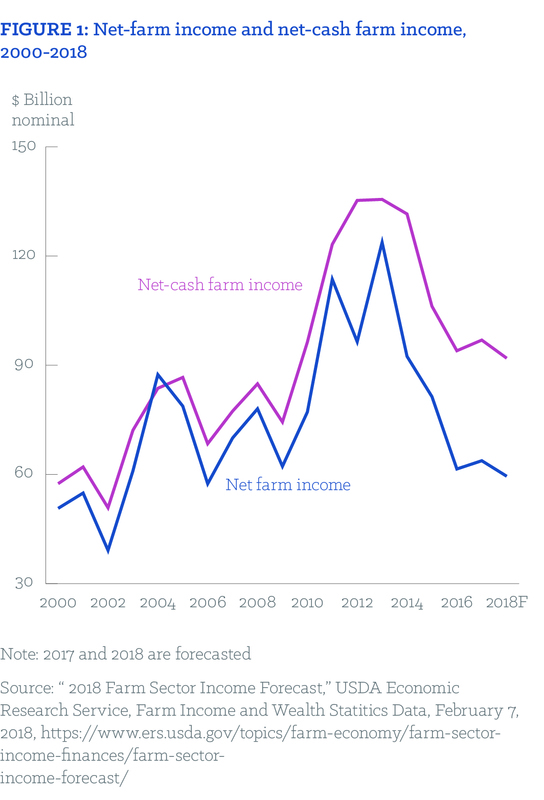 And, while various commodity and insurance programs have kept many farmers afloat, they have not worked effectively when farmers experience a series of consecutive low-price years as we are seeing right now. While the current farm economy is linked to policy choices made in past Farm Bills, inside Washington agribusiness interests rule. There appears to be little desire to address core market challenges, like below-cost prices and the decline in farm income. The wisdom of the Farm Bill’s implicit premise—to encourage overproduction of a handful of commodities for the benefit of agribusiness and plan for ongoing financial stress for farm families—generally has gone unquestioned. As Congress deliberates on the 2018 Farm Bill, both the House and Senate Agriculture Committee Chairs are currently promising more of the same. While the farm economy tied to the global economy is stumbling, there are relatively smaller, but faster-growing domestic markets where demand actually outstrips supply, and where a growing number of farmers are seeing a profitable path forward. Rising consumer and food company demand is driving price premiums in the organic, grass-fed, free-range and locally-sourced markets. Food and agribusiness companies are also responding to investor demands for greater environmental sustainability in their sourcing—and trying to access these emerging markets. Increasingly, buyers are asking farmers and ranchers to reduce their fertilizer and pesticide use, lower greenhouse gas emissions and protect waterways. 74 percent want to know the state of origin of their food. 86 percent of consumers believe genetically engineered (GE) foods should be labeled. These shifts in consumer preference, and the marketplace that serves them, offer new opportunities for both higher prices and in some cases, lower production costs for farmers. But the transition to new crops or new systems of grazing and production require farmers to take risks—a difficult proposition in the current downturn. 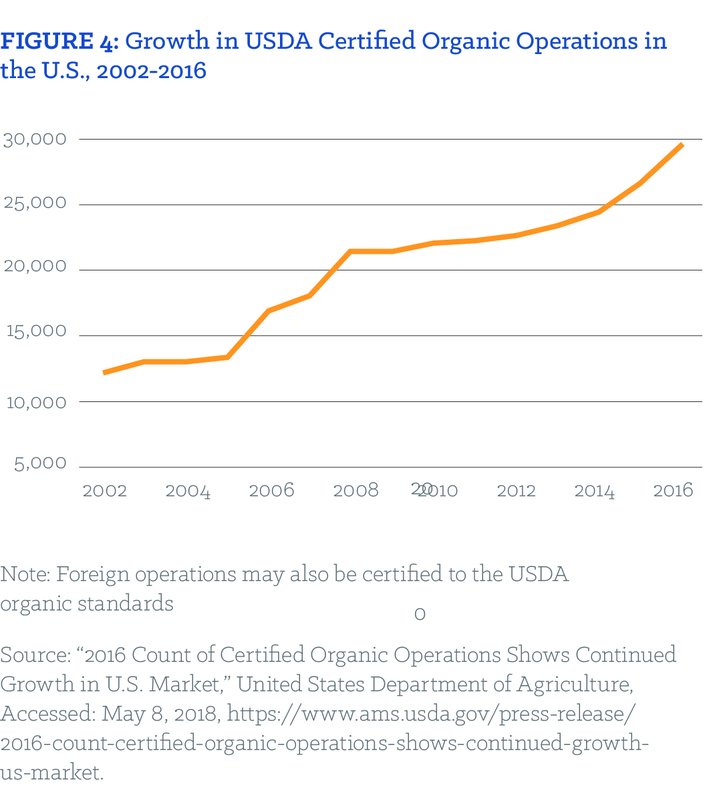 Some certifications needed for farmers to access those markets can be costly and take time—for example, the transition for organic certification takes three years. Additionally, a strong infrastructure to process, store and transport foods targeting these new markets lags behind consumer demand. And while agribusiness and food companies are demanding more of farmers in terms of environmental sustainability, they often aren’t willing to pay a high enough premium price to aid farmers in that transition. In all these areas, supportive Farm Bill programs outlined later in this paper could play an important role in aiding farmers who want to access these emerging, and potentially more profitable, markets. Organic farming requires third-party certification to meet standards set by the USDA through its National Organic Program and further defined at the National Organic Standards Board. Those standards include bans on synthetic pesticides, genetic engineering and the use of antibiotics in meat production. 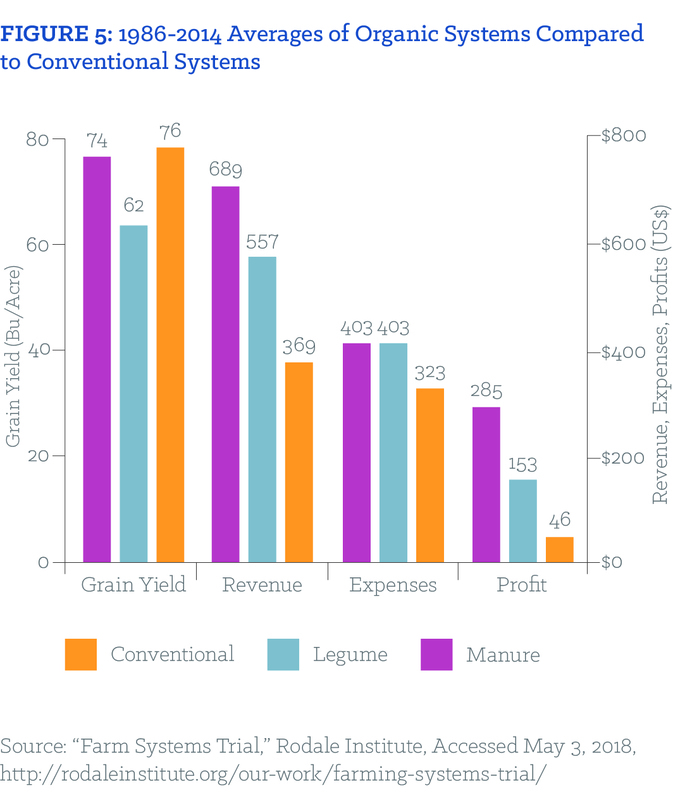 The Rodale Institute has done the longest running side-by-side research of organic systems versus conventional grains, considering yield, revenue, expenses and profit. Organic systems using manure or legumes consistently out-perform conventional systems from a farmer profit basis. According to an analysis of net returns of five crops (corn, soybeans, oats, alfalfa hay, mixed hay) in 2015 for organic and conventional farming in the Upper Midwest, organic consistently outperformed conventional crops.22 A comparison of organic corn and soybeans to their conventional counterparts can be difficult; organic production requires a crop rotation plan with typically four to six crops, while conventional production generally does not rotate or only includes one other crop in the rotation plan. The longer rotations in organic production often include hay, which can increase profitability by feeding into another fast-growing market—the grass-fed beef and dairy sectors. Organic farmers also must deal with the threat of genetic contamination from neighboring farmers planting GE crops. Such contamination can strip organic farmers of their certification for three years. The USDA estimates that organic farmers suffered more than $6 million in losses between 2011 and 2014 due to GMO contamination.27 Organic farmers have also struggled to gain access to good crop insurance programs through the Farm Bill that cover the organic premium price, the value of organic land, and diverse operations (i.e. a variety of crops and possible integration of livestock). 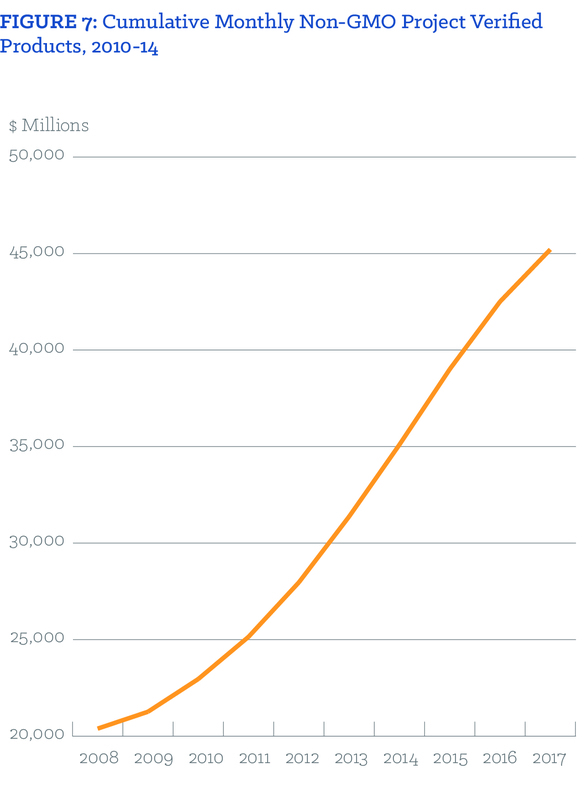 The grass-fed beef sector is one of the fastest-growing segments of the food industry. Grass-fed beef distinguishes itself from conventional beef at the finishing stage. Most cattle in the U.S. are grass-fed through their first 9-15 months, and then finished on grain to fatten them up. Grass-fed cattle stay on grass, take longer to finish, and are often slaughtered between 20-28 months. Consumers are seeking out grass-fed beef for a variety of reasons, including health. Grass-fed beef has a significantly better omega-6 to omega-3 fatty acid ratio, a higher concentration of conjugated linoleic acids (CLAs), higher levels of antioxidants and a lower risk of E. coli infection and antibiotic-resistant bacteria. Animal welfare, environmental protection (reducing water and air pollution connected to feedlots), and endorsements by many of the nation’s top chefs are additional market drivers. Retail sales of grass-fed beef are doubling each year, growing from $17 million in 2012 to $272 million in 2016, according to a 2017 report by the Stone Barn Center for Food and Agriculture, and the investor firms Armonia, Bonterra Partners and SLM Partners. According to Beef Magazine, grass-fed now makes up seven percent of total sales, growing between 25 and 30 percent per year. Some of the bigger players in the meat industry like JBS and Perdue are starting to invest in the sector.31 While much organic beef is grass-fed, not all grass-fed beef is certified organic. Two other meat and poultry focused market segments are also responding to growing consumer demand—hormone and antibiotic free, and stronger animal welfare standards. According to the National Marketing Institute, 67 percent of consumers want their grocery store to carry meat and poultry raised without hormones, and 66 percent want meat raised without antibiotics.32 Food companies are increasingly employing animal welfare standards, and states are starting to establish more welfare regulations such as crate sizes for birds and gestation crates for pigs.33 These segments can have crossover with the grass-fed market. Similar to organic, 100 percent grass-fed beef sold under a third-party certified label offers ranchers up to a 50 percent premium for those who sell directly, and up to 25 percent for those who sell into supply chains, according to the Stone Barn Center. There are an estimated 3,900 grass-fed cattle producers currently, up from just 100 in 1998, according to the Center. A major obstacle to growth for the grass-fed beef industry is the lack of infrastructure, namely meat processing plants in strategic locations around the country that grass-fed ranchers can access. One of the outcomes of the consolidation of the conventional beef industry (JBS, Cargill, Tyson and National control 80 percent of the market34) is the loss of small- to mid-sized beef processing plants around the country. Those that remain are often costlier per pound or per carcass to process. The current mega-sized processing plants serve the conventional market. 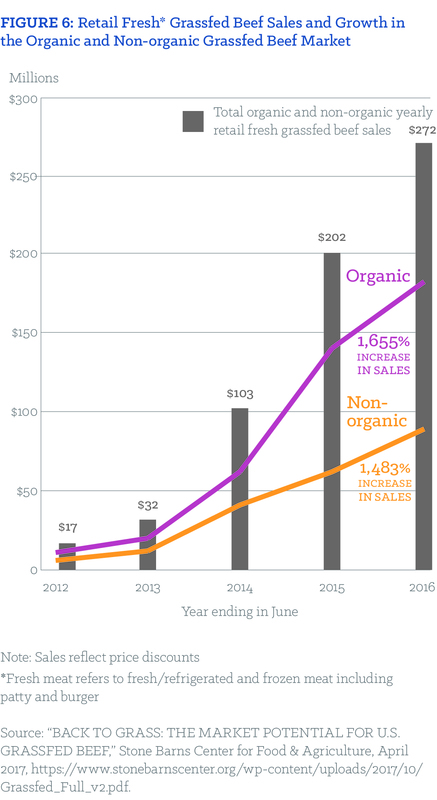 And like organic, another major challenge in the grass-fed market is under-priced imports. According to the Stone Barn study, 75-80 percent of labeled and unlabeled grass-fed beef in the U.S. marketplace are imports. The lack of mandatory Country-of-Origin-Labeling for beef in the U.S.—undermined and ultimately killed by the conventional beef industry in Congress—makes it difficult for consumers to know where their grass-fed beef was raised. There is also a lack of a broadly accepted certification or verification of grass-fed (despite some strong certification systems out there) by consumers, allowing for meat producers to make fraudulent labeling claims. A non-GMO product is simply a crop that did not come from genetically engineered seed. Certified organic food is non-GMO, but not all non-GMO is organic. The non-GMO market (non-Genetically Modified Organisms) has grown by $8 billion since 2012 to $21.1 billion in 2016, reports Progressive Grocer.35 Since GMO crops first entered the market in the mid-1990s, polls have consistently shown that 90 percent of consumers want GMO labeling. In 2016, Congress passed a controversial GMO-labeling bill requiring the USDA to develop new label requirements—the agency is expected to roll out its proposal later in 2018. The 2016 law was highly criticized because it gave food companies the option to use QR codes to be read on smartphones instead of on-package labeling to disclose GMOs, which adds a barrier to consumers accessing the information. The federal labeling law was passed largely to override a series of stronger state-level labeling bills, which the food industry had opposed as an unworkable state-by-state approach. Now that mandatory GMO labeling in some form is coming, the market for non-GMO foods is likely to grow further. The primary GMO crops on the market are corn, soy, cotton, canola and sugar beets, with some additional crops like papaya and apples and potatoes. Food companies are looking for non-GMO sourcing for all these foods. A major challenge is a lack of infrastructure (storage and processing facilities, transportation and equipment) to keep non-GMO crops separate from the conventional GMO crop. The variability in price premiums continues to be a challenge for farmers. However, the lower associated seed costs (especially if purchasing untreated, non-GMO seed) can help regardless of market premiums with today’s low conventional prices. Locally-produced food does not have a specific definition; however, it is broadly described as products grown and consumed within a given state or region. Often, it is either purchased directly from the farmer, or the farm where it was produced is identified in some way—either through a label, on a menu, or by an institution—giving the food extra value to the consumer. 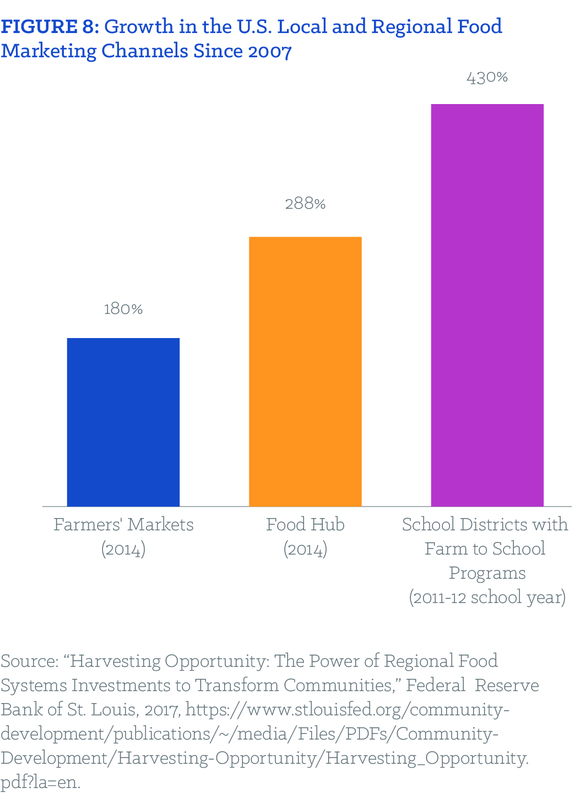 The value of local food systems goes deeper than just economics. Farm-to-Head Start and Farm-to-School programs incorporate local food and farming themes into educational curriculum, shaping children’s understanding of food and farming to value local farmers and solidify healthy eating habits right as they are forming. Infrastructure like storage, aggregation facilities and transportation to serve local markets continues to be a major challenge. Local markets without adequate produce and meat processing facilities, transportation and delivery can raise costs and create hurdles for local food system development. Potential buyers, like major institutions (i.e. universities or hospitals), need locally-produced food aggregated and processed in a usable way. Banks and credit institutions often don’t have experience in financing local foods-oriented projects and are reluctant to take risks. Food companies and agribusiness firms are demanding greater sustainability practices from farmers in their supply chains.46 For the first time, many are tracking issues like water quality, greenhouse gas emissions, and soil health in their production and sourcing. New developments in agricultural technology, like so-called Big Data and blockchain technology, could push the market further toward greater sustainability and transparency in supply chains. These industry shifts are a result of growing consumer and shareholder interest in these issues. But, there are also concerns that many of these industry initiatives reflect marketing goals more than real commitments to sustainability. Food companies often refuse to pay farmers and ranchers a premium for shifts in practice, many of which are costly in the short-term. The lack of third-party verification also raises questions about following through on public pledges. Nevertheless, there is little question that the food industry is looking to show progress on a variety of sustainability indicators to the public and to shareholders. Meat companies like Smithfield, JBS and Tyson Foods are all making pledges to reduce greenhouse gas emissions. These voluntary pledges often rely on something called “emissions intensity”—in other words, emissions per kilo of meat or poultry. The emissions intensity approach avoids the more substantive goal of addressing overall greenhouse gas emissions, something that would likely require a reduction in production for these meat companies. Will Companies Pay for Sustainability? While most of agribusiness and the food industry are involved in sustainability initiatives that make demands of farmers, the costs of implementing these new practices and systems fall squarely upon the farmer. Many of these programs aren’t paying farmers a premium price, or high enough of a premium price, for the changes they need to make, some of which could affect short-term production yields and profits. While most shifts toward greater sustainability have long-term benefits, particularly around supporting soil health or pollinator habitat, those benefits may not come soon enough for farmers facing immediate, short-term economic challenges. Agribusiness announcements on climate and sustainability—marketing or real action? Archer Daniels Midland (ADM) is investing in a project to inject carbon dioxide underground, hoping to store more than a million tons of carbon dioxide each year. Hog giant Smithfield has pledged to reduce GHGs in its supply chain by 25 percent by reducing fertilizer used to produce animal feed, decreasing water use, increasing energy efficiency at their facilities and improving their manure management. The company is investing in biogas production that converts hog manure on some of its operations in Missouri into natural gas pipelines. General Mills pledged in 2015 to reduce the company’s GHGs by 28 percent by 2025, with much of the reduction focused on upstream sourcing from agriculture. General Mills is partnering with USDA and Xerces to fund pollinator projects on 100,000 acres of farmland over five years to protect and restore pollinator habitat. Kellogg has also been outspoken on climate commitments, including the Paris Agreement, and is working to reduce emissions in its agricultural supply chains through reduced fertilizer use and water quality efforts around the Great Lakes region. The seed and pesticide company Monsanto is working on an initiative with universities to measure and report GHGs in agriculture. Walmart stepped up demands of its suppliers in 2014 to reduce fertilizer use in its supply chains. Costco has taken a stand against pollinator-killing neonicitinoid insecticides when it comes to their garden supplies and have pushed for more organic products in its food sourcing, according to the company’s bee policy established last year. DanoneWave, Ben & Jerry’s, General Mills and MegaFood are working with partners to develop a new global standard for regenerative agriculture that encourages farmers to restore the carbon cycle and build soil health. As we’ve seen in the market growth of organic or grass-fed beef, paying more for sustainability works. Payments in the form of government programs can also be effective if the payments are high enough. For example, on Maryland’s Eastern Shore, the state pays farmers extra money per acre to grow cover crops as part of an initiative to protect the Chesapeake Bay. Farmers there now plant cover crops on more than 50 percent of the acres in the region.58 Iowa and other states have similar programs, but their success rate depends largely on the price per acre. The U.S. Farm Bill is a wide-ranging, massive piece of legislation. Passed every five years, the Farm Bill’s dozen or so titles cover areas such as commodity programs, crop insurance, conservation, nutrition, energy and rural development. 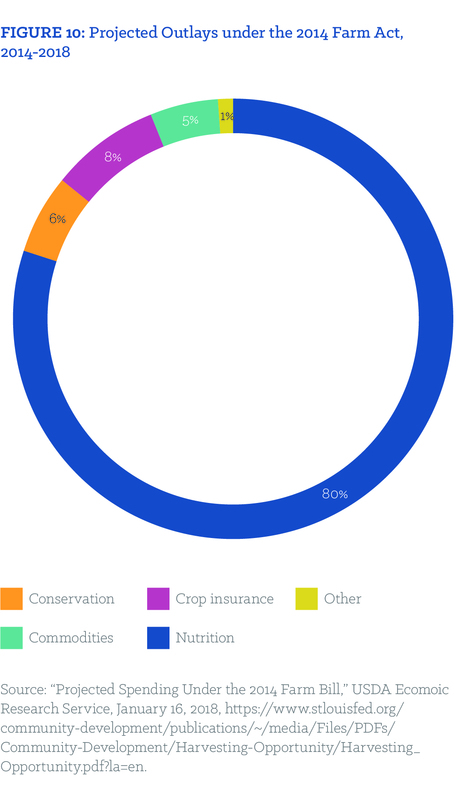 And while the bulk of Farm Bill spending comes through the nutrition title (somewhere between 70-80 percent), much of the farmer-oriented resources go through two big programs: The commodity title and the crop insurance programs. Those programs are designed primarily to provide farmers who grow commodity crops with a safety net if the market drops and prices dip below the cost of production. Despite its many titles, the Farm Bill does not explicitly support transitioning the farm economy toward a system grounded in farmer profitability, rural resilience or sustainability. This is not to say that the Farm Bill doesn’t have a wide range of important programs that could significantly aid the transition toward greater sustainability and profitability, but those programs are grossly underfunded to meet demand. And their goals, whether it is soil or water quality, pollinator health, organic transition, seed breeding, or infrastructure, operate separately from commodity and crop insurance programs. Instead of integrating sustainability throughout all farm programs, conservation programs are siloed within their own title and program, separating the bottom line of farming from environmental goals. A new approach to the Farm Bill could help farmers engage in new, potentially more profitable markets, by providing farmers with the much-needed resources to make long-term investments in their operations. Many of the reforms needed to aid in this transition do not require radical restructuring and the creation of new programs, but rather shifting the resources and goals of existing programs. Reforming the Farm Bill and other policies to aid farmers in the transition toward more profitable, sustainable markets should focus on three areas: Transitions on the farm, infrastructure, and marketplace integrity. Working lands conservation programs, where farmers implement conservation practices on land actively being farmed, provide much-needed support for farmers to engage in climate, water, and soil-friendly practices. The Conservation Stewardship Program has initiatives that focus on soil health, water quality, perennial grasses, sustainable livestock management and cover cropping.60 The Environmental Quality Incentives Program (EQIP) and the Agricultural Conservation Easement Program (ACEP) are working lands programs that can support agricultural resilience, strengthening farmers’ ability to absorb and recover from weather extremes and other stresses. Recent Farm Bills have cut conservation programs, and there are signs that further cuts are coming in the 2018 Farm Bill. These cuts come despite the popularity of these programs among farmers, where applications far exceed available resources. These programs should be expanded to serve farmers of all types, sizes and geography. Rep. Tim Walz (D-MN) has introduced the SOIL Stewardship Act that would increase funding and technical assistance, improve coordination between working lands programs and aid farmers transitioning to organic.61 Better conservation outreach, planning and implementation support—as well as better measurement, evaluation and reporting—can make these programs more effective for farmers. The nation’s agricultural extension service housed at land grant universities around the country is essential for the nation’s farmers. There has been a disinvestment in agricultural extension and an increasing reliance on private industry to work with farmers and perform research over the last several decades. A reinvigorated, better-resourced agricultural extension system focused on transitioning farmers toward emerging sustainable markets is essential. The Organic Cost Share program helps farmers pay for organic certification. A greater investment would aid farmers in their three-year transition process before they can access the organic premium and other third-party certifications such as “grass-fed” and “humanely raised” that bring public benefits. These funds are critically important in this difficult financial environment. A larger percentage of these loans are going toward the continued construction of large-scale animal and dairy operations. The loan programs should shift away from those specialized animal operations and offer greater access to farmers seeking to target more profitable, emerging markets. USDA-backed loans focused on these emerging markets would aid banks in further engaging in local food development and finance. A major barrier to expanding new, more profitable markets for farmers is infrastructure. For example, there are fewer than 200 facilities that are certified organic and able to handle certified organic feed grain corn.65 More facilities are needed for the market to become accessible to farmers. A major push toward building new food system infrastructure also should be part of a rural development plan to create new jobs in rural communities. Investments in regional food economies could target areas such as storage, aggregation, transportation, and processing capacity. A growing number of Food Hubs are setting up around the country to meet these needs.66 Assistance in marketing and business planning can help farmers and local food businesses and investors. A number of Farm Bill programs could greatly help in building this infrastructure. The Local FARMS Act introduced by Sherrod Brown (D-OH) in the Senate and Chellie Pingree (D-ME), Jeff Fortenberry (R-NE) and Sean Maloney (D-NY) in the House would solidify funding for a number of already successful local foods system programs in the Farm Bill. The bill brings together the Farmers Market and Local Food Promotion Program and the Value-Added Producer Grants Program to streamline support for farmers markets, farm to retail marketing, local food infrastructure projects and producer-owned enterprises. It stabilizes money for the Organic Cost Share Certification Program, which assists farmers in transitioning to organic production. The bill helps farmers manage additional costs to meet new food safety rules and regulations, while also provide additional training. The bill would make it easier for schools to procure locally- and regionally-produced food. And it would expand the ability of rural development and farm service agency grants and loan programs to be used to support livestock, dairy and poultry supply chain infrastructure. Because GMOs are prohibited under organic standards, any level of contamination found in organic product or on organic farms directly threatens the livelihoods of organic producers. A legal liability regime needs to hold GMO seed companies liable for losses associated with their product. The organic feed market has been severely harmed over the last several years from likely fraudulent corn and soybean imports coming through Eastern Europe. Cheap imports of grass-fed beef from Australia and New Zealand also undermine U.S. grass-fed beef producers, particularly if they have not been third-party certified. Stronger enforcement to ensure the integrity of products targeting specialty markets will be essential, as will mandatory Country of Origin Labeling (COOL) to improve transparency for consumers. Consumers need to trust the labels of these new markets. Robust third-party certification systems are essential. The development and updating of standards must be open and require comment periods. Greater transparency of the supply chain adds to the integrity of the standard. Strong standards are essential to maintain the position of the farmer/rancher in the marketplace. USDA has a role to play in this, just as they did with the USDA Organic program (especially if they also learn lessons from that process). Just as consumers want greater transparency in the food they purchase, farmers and ranchers need greater transparency in the market to which they are selling. This means greater transparency in prices paid for the organic, grass-fed, non-GMO and local foods markets. Greater openness in market prices, as well as contracts, provides farmers with some leverage in the marketplace, where they are largely price takers without the economic power to set their own prices to cover costs. The USDA has started to expand reporting for several organic commodities and grass-fed beef in recent years, but more needs to be done. The accelerating concentration in agricultural markets has left just a handful of companies controlling most sectors. This level of market power has squeezed farmers on the input/seed side, as well as on the marketing side. As the organic industry has grown, it has seen some of the same shifts toward concentrated markets as the conventional food industry.67 New and emerging markets must maintain competition through aggressive antitrust enforcement—including a recognition and assessment of how mergers affect farmers and ranchers—in order for this emerging system to work for farmers. A reorienting of the Farm Bill and other policies toward farmer profitability and sustainability would require a major shift in priorities for those in Washington. But the dire state of the current farm economy, the challenges facing rural communities, and the increasing dependence on the whims of the global market require new thinking—and a very different Farm Bill. Download the PDF for the endnotes.